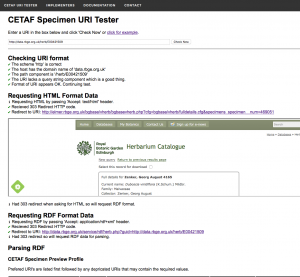 Back in July 2013 we held a workshop here at RBGE on the use of HTTP URIs (also known as URLs or just plain web addresses) for specimens. This is an important technology that will allow scientists to refer to the specimens they use in their research. The desire is to allow “clicking through” to raw research materials in all possible contexts when specimens from major natural history collections are mentioned. Building research infrastructure like this takes time not because it is necessarily technically complex but because consensus needs to grow across major institutions and be followed up by the will and resources to implement corresponding solutions. Another small step was made along the way this week with the launch of a tester application here at The Botanics. The CETAF Specimen URI Tester has been developed as our contribution to the on going standardisation efforts. It allows implementers of the HTTP URIs to test if their implementation meets the proposed technical standards. Perhaps the most significant part of this simple website is the page listing the known implementers of URIs for specimens. It contains twelve major institutions housing many millions of specimens. Hopefully we are reaching a tipping point where it will be come standard practice to take this approach.